← Version “Fall Into Darkness” Released! Added a brand new feature – decals! These graphics are applied to the level geometry, and dramatically increase the amount of gore! Added the SpawnImpactDecal() AI scipt command, which allows objects to spawn decals at their point of impact against a face. Added the SpawnFloorDecal() AI script function. It does what you think it does. Added the +nodecals surface flag, which prevents decals from spawning on certain surfaces. Added a surprise to E1L6! Made some improvements to E1L6′ to improve clarity. Added remade spike balls, along with a new instakill variation! Wrack now prompts you to restart the game when selecting a subscribed mod to play. The Subscribed Maps/Subscribed Mods menus now indicate when subscribed content is still in the process of being downloaded. Wrack now displays the “NEW!” notification when new objects have been downloaded from the Steam Workshop. Improved the leaderboard menus’ display and input handling which retrieving scores. 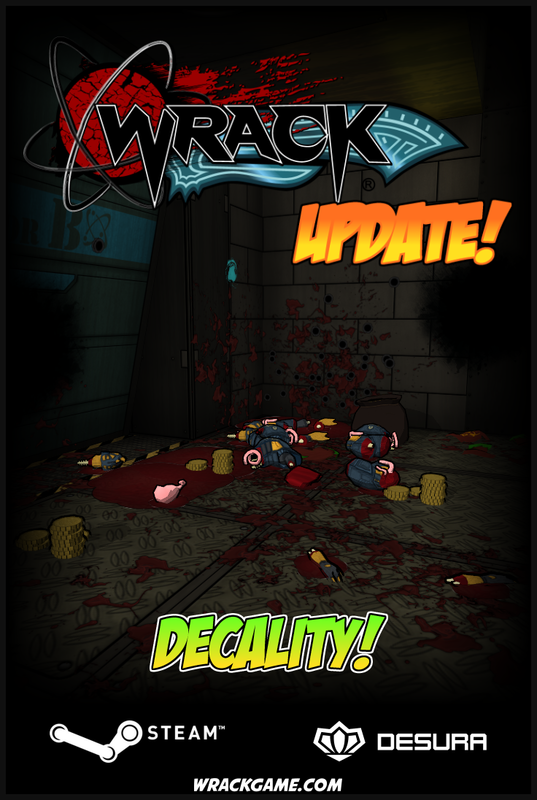 When trying to load a mod with an error, Wrack now displays a message box saying that the mod will be unloaded so that you can start Wrack normally (and actually does it, of course). Removed the “Featured Maps” menu. The system has essentially been replaced by the Workshop. The left mouse button can now be used to advance past the title screen. Added the SFXF_PLAYIFOUTOFRANGE sound effect flag, which allows sounds to play even if they’re too far away to be heard. Updated a few more E1L6 textures. Applied a bloom map texture to the Blast Guard – making it glow in the dark. Fixed a bug that sometimes caused you to fall out of the map if you hit your head on a lift. Fixed a bug that caused the Blast Guard to be used against projectiles fired by monsters you’ve killed. Fixed a bug that caused the title demos to use weapons you finished the game with. The current music track is now properly restored when loading a quicksave. Fixed a bug that caused objects to not properly rest on moving faces when loading a quicksave. Gradient fog is now restored properly after loading a quicksave. The “player died” event is now sent to all AI scripts when the player dies. Giggordo now goes idle once the player dies. It’s already out on Steam and the website, and should be up Desura shortly. One Response to Version “Decality!” Released!